Posted by makingyourdashcount in Air Force, BMT, graduation, Lackland, military, Thoughts. It's hard for me to express the pride I've experienced the past few days, while at Lackland Air Force Base's Basic Military Training (BMT) graduation. It came not only from the thousands of family and friends there through t-shirts, tears and buttons pronouncing their son or daughter or spouse was now an airman, but also from each and every airman, him or herself. The sense of accomplishment earned at boot camp shined through on their eager faces. Special congratulations to Airman Ashley R. She has grown two inches in stature and confidence in the long six weeks of BMT. Always a young woman with determination, I have no doubt that the Air Force will be a better place because she chose service to our country through them. 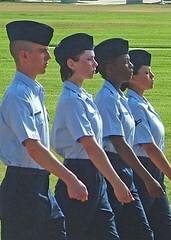 For more pictures from the June 9,2006 graduation, click the picture of Ashley and her fellow Airmen. Because of the number of visits to this page from people interested in Lackland graduation, I will relay our trip to the base. We stayed on the Riverwalk making it a double duty vacation. It is absolutely beautiful down there and felt safe, no matter what time we walked around. I have nothing but good things to say about the Drury Inn and Suites. By far the least expensive hotel on this prime part of the River Walk, the hotel was within walking distance to EVERYTHING downtown. Ten minutes to the Alamo and 5 from affordable restaurants. This hotel comes with continental breakfast including sausage, eggs and waffles. But the bonus was the cocktail hour, with complementary drinks mixed to order ( regular and virgin) popcorn machine and the open soda fountain. I know we saved over buying cans from a machine. You get three drinks per adult per night. We had fun trying drinks that were new to us. I am now a tequila sunrise fan! Our daughter loved the spicy virgin bloody marys and the shirley temples. After graduation, we were able to take our graduate off base. I called the hotel and asked if we could bring her, her sister and boyfriend back to the hotel to swim. They gave us definite thumbs up. After 6 weeks in boot camp she appreciated the soak. So, if you can afford the Riverwalk, I would definitely stay there. In looking for hotels, I found some good rates near the medical center, so it may be worth looking there too. I heard that the hotels close to the base were on the seedier side, but to tell you the truth the national chains looked just fine from the outside. If we didn’t have a car, I don’t think I would have hesitated staying there. I think it would be cheaper to stay near base, if you are under 25 and have to pay exorbitant car rental prices, too. I couldn’t believe the rates that some people with us had to pay. While in San Antonio we also went to visit the Missions.. there are some terrific Kodak Moments and the Alamo, of course. We went to the IMAX show, but thought it was a bit expesive for a movie seemed less than factual, at times. It was mildly entertaining, however. Our trip there was extremely memorable. Although the focus of your trip will be your airman, take advantage of being in San Antonio; it is a great city. wow. im soo excited to go see my boyfriend graduate BMT next week! im soo proud of him and of course miss him soo much! reading this made me get teary eyed! congrats ashley! I came across this page googling “What to expect during basic”… I’m currently a college aged student but ran out of money and couldn’t afford to go to college so I’m enlisted. I leave for basic in September and I’m nervous as ever. Although I have taken 3 years of AFROTC I still feel like this will be a new situation for me.. Thank you for posting this blog, it has helped me out tremendously.